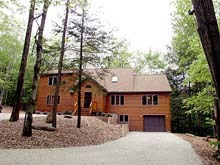 Brand new 3400 sq ft Lee home in a private lake community, Berkshires. 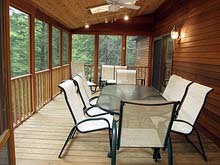 Situated on 4 wooded acres on a quiet country road. This pristine home features two master bedroom suites plus 3 additional bedrooms, 5 baths, spacious living room with vaulted ceiling & skylights, fully equipped kitchen, dining room, cozy stone fireplace, hardwood floors, full basement, huge screened porch with designer furniture, paddle fans & skylights, and outdoor deck with Weber gas bar-b-que. Walk to our private community tennis courts, private sandy bottom beach on the cleanest lake in the Berkshires, swimming, boating, canoeing and sailing area. 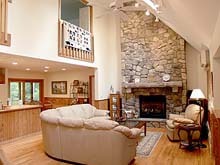 Just minutes to Tanglewood, Jacob's Pillow, Norman Rockwell Museum, Lenox, Stockbridge, Great Barrington, golf courses & shopping. EVERYTHING BRAND NEW!! Beds: 2 kings, 4 twins, 2 sleeper sofas (new technology - queen-size).